Secondary Inscription: (Verso) on the mount, inscribed "...Bourdon" in black chalk. After forty days and forty nights on Mount Sinai, Moses returns carrying the Ten Commandments, only to find the Israelites worshipping a golden calf instead of the true god. Strong theatrical gestures express the various emotions and activities of the Israelites. Sébastien Bourdon used browns with white accents to evoke a full range of light, shadow, and form. Oil paint and pen and ink cover nearly the entire surface of the paper, making this highly finished drawing resemble a monochrome painting. 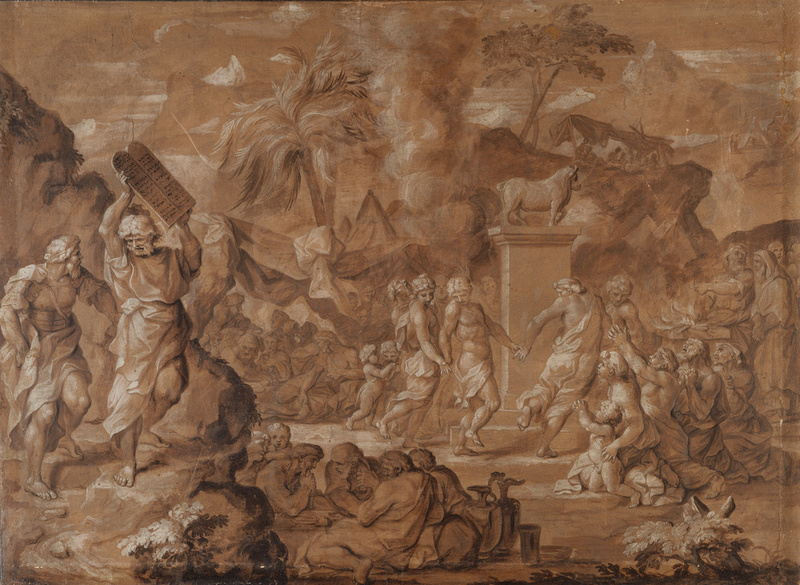 Bourdon repeatedly depicted the dramatic events from Moses' life.